If you suffer an eye injury or wake up to see that you have bloodshot, oozing eyes, don’t panic and rush to the hospital emergency room! Our compassionate and qualified eye doctors are experienced in treating a wide range of eye emergencies. Contact us immediately to receive urgent eye care in our Copperas Cove office. Our office is furnished with state-of-the-art diagnostics and the latest technology to ensure that you receive a precise diagnosis and treatment. If you experience an infection or eye injury in Copperas Cove, call us for assistance. If you experience any of these symptoms, don’t ignore them! Immediate treatment can prevent many complications with your vision. 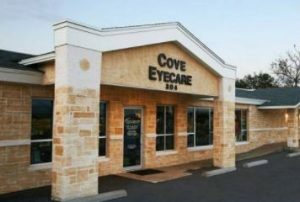 Call us to book an eye exam; if we detect a serious medical condition that requires an ophthalmologist or surgical care, we’ll refer you to a leading eye care specialist in the Copperas Cove area. A variety of culprits can lead to eye infection. Any foreign object or substance, even something small and mild, that comes into contact with your eyes can cause irritation or a surface scratch on your cornea. Once your eyes are irritated, they are vulnerable to infection. Wearing contact lenses that were not sterilized is a typical cause of eye infections. If you wear contacts and suspect that you have an eye infection, take your lenses out immediately and wear eyeglasses until you have an eye exam. You may require treatment with antibiotic eye drops or ointment. We frequently diagnose corneal scratches when patients visit our Copperas Cove clinic due to eye injury. This is a minor problem that can be caused by many everyday objects, such as a fingernail, tree branch, or piece of paper. Symptoms include pain, tearing, redness, blurry vision, and/or a headache. Do not rub your eye or wear contact lenses. Most of the time, the scratch heals in a few days. However, sometimes it leads to an eye infection. If you suffer a scratch to your cornea that seems to be getting worse, contact us for eye emergency treatment. Eyes are very sensitive. Even the tiniest foreign object, such as a grain of sand or stray eyelash, can be irritating. In response to this object, the eye’s blood vessels dilate and the conjunctiva (mucous membrane over your eye), cornea, and eyelid may swell. The longer the foreign body is stuck in your eye, the greater the risk of eye infection. If you think that the offensive item pierced the outer layer of your eye, do not attempt to remove it on your own – and it is dangerous to delay in seeking treatment! We are experts at removing foreign objects safely to prevent complications and vision loss; contact our office for assistance. 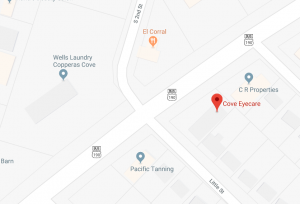 At Cove Eyecare, our eye doctors provide full-service for all your ocular needs – including eye exams, eyewear, ocular disease management, and emergency eye care. What causes a stye or chalazion? How to treat a stye or a chalazion? Read more here.